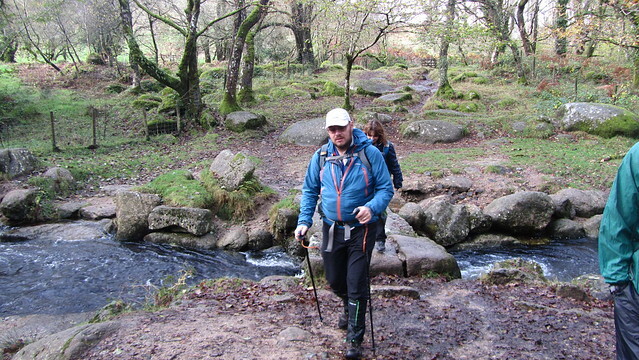 When I raised the idea of a few Social Hiking friends joining me for a couple of days on Dartmoor, little did I know that the majority would take me up on the offer! I was pleased they accepted, but it did pile a little pressure on me to meet a, to be fair, self imposed, criteria that would make them fall in love with my favourite national park, and have them chomping at the bit to return. 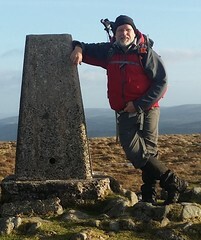 My challenge was to come up with a couple of walks that would be comfortable to complete, whatever the weather, and would show off some of the best of the park. 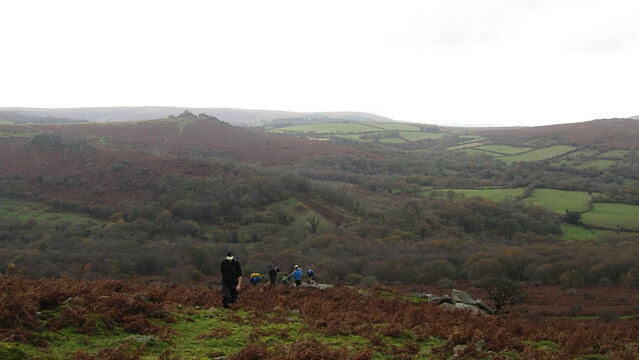 There was also the added labour of love, that is satisfying their competitive streak of bagging peaks, or, in the case of Dartmoor, bagging Tors. 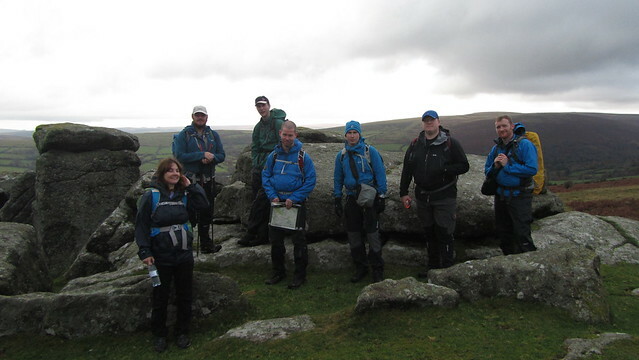 The majority converged on the Plume of Feathers Pub and Bunkhouse, in Princetown, at various points of the Friday; Matthew first, then Jim and I, closely followed by Cath, Dean and Phil. Rik was to arrive later that evening, leaving Richard to take the overnight sleeper from London and meet us in the Fox Tor Cafe the next morning. 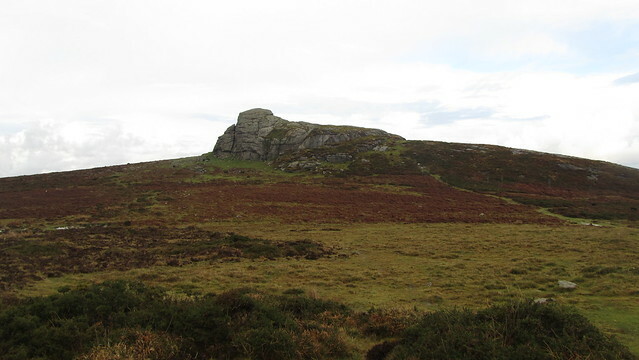 For the Saturday I toyed with a route deep into the mire of the north moor but the days leading up to the meet had been soggy, so I went with an easily navigable circular in the area of Haytor Rocks, one I had traversed twice before. As this is a well trodden route you can also read in Haytor Rocks Circular and Hound Tor Revisited, I'll keep this relatively brief. With everyone gathered, we drove from Princetown in a convoy of two cars, heading over the moor via Postbridge, Runnage and Widecombe-in-the-moor, to a car park on Bonehill Down, beside the B3387. Stepping out of the cars, we had our first threat of rain, and we all immediately donned waterproofs in anticipation. So we set off; Bonehill Rocks is first up, and from here, the tors and rocks come thick and fast. It wasn't long before the threat of rain subsided and we were all removing our waterproof layer to prevent overheating. Despite a brief five minute spell later in the afternoon, the weather behaved. 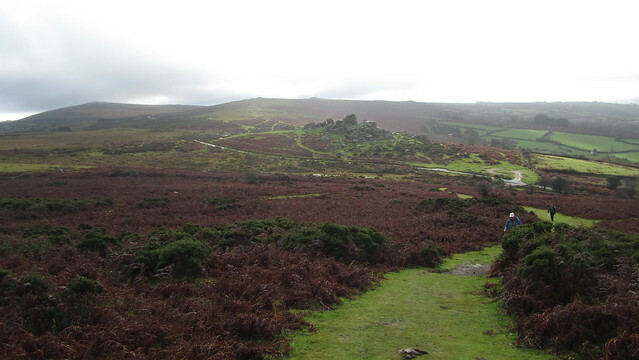 From Bell Tor, we left the obvious path up to Chinkwell, contouring left, in search of Sharp Tor (Chinkwell). 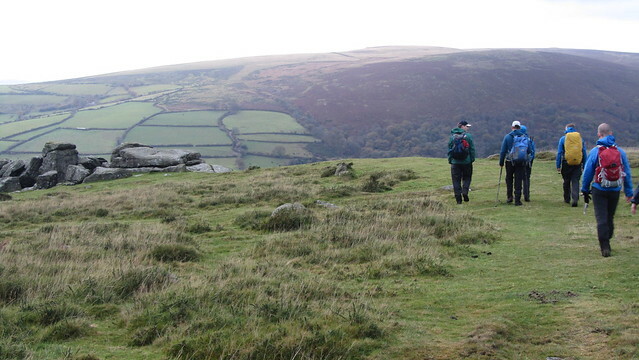 We then returned to the main path at Chinkwell Tor, and further to Honeybag Tor, before looking east to Hedge Tor. On Jim and I's last visit to Hedge Down, we had to traverse a particularly sodden stream and return the same way before picking our way through a mire. On this occasion, we found a gate on the other side of the field, and saved ourselves a good half hour, if not more, of faffing. 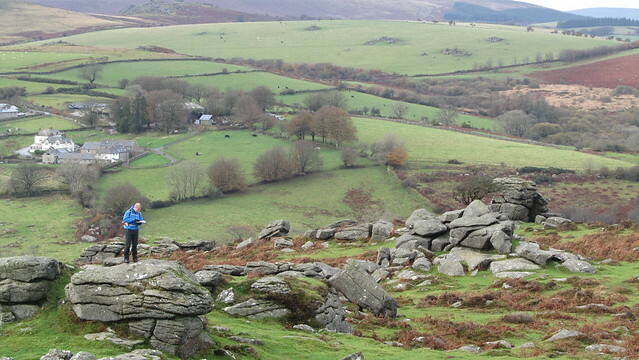 It wasn't long before we were amongst the granite of Hound Tor, where we had a rest and a bite to eat. After lunch, we wandered over to Holwell Rocks, a low stumpy tor that is almost lost in the wall that runs behind it. It may have been of more interest to visit the medieval settlement of Hundatora Village but it is listed by Ken Ringwood, and so who are we to argue. Further on, Greator Rocks is a different beast entirely! This tor is aptly named; it is indeed "Great". 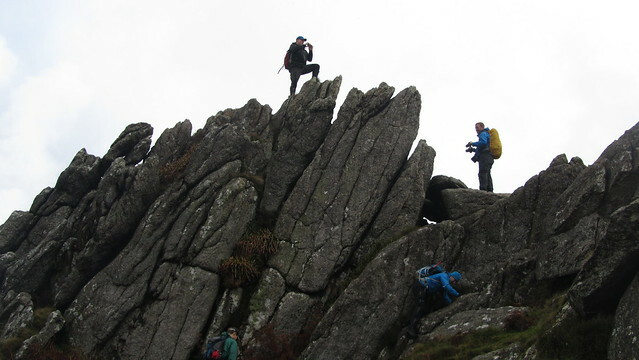 Some of the group took the opportunity to scramble up to its summit and take in the views. 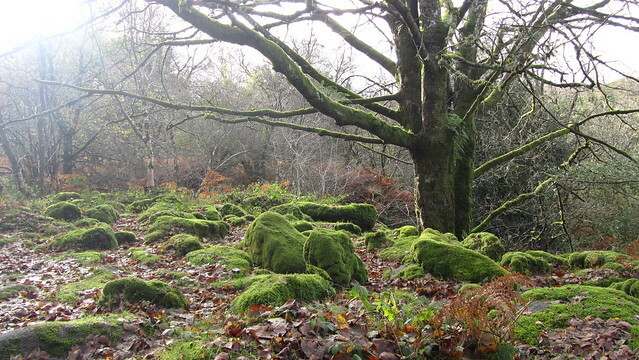 We descended down into the valley of Becka Brook, with a typical autumnal woodland scene of moss covered granite littering the floor, trees decorated with old man's beard, and a carpet of fallen leaves. Out of the woodland, we began the ascent to Hole Rock. For me, suffering from a chest infection for the past week, the climb was exhausting, and I was the last to reach the first rocky outcrop on the route. But once there, the gradient got easier and I cracked on to Hole Rock. 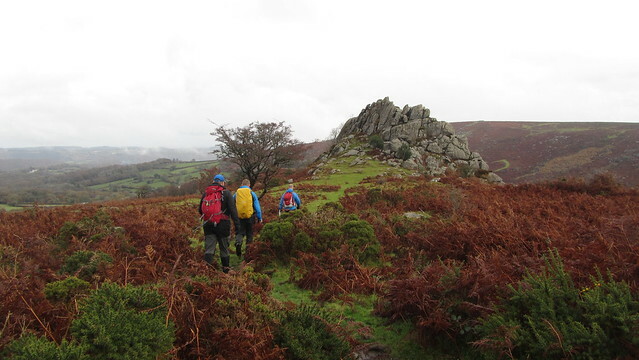 The rain returned long enough to convince us to put on our jackets, but soon moved on as we strode passed Smallacombe Rocks and across Haytor Down to the towering granite formation that had been in our sights for most of the day. 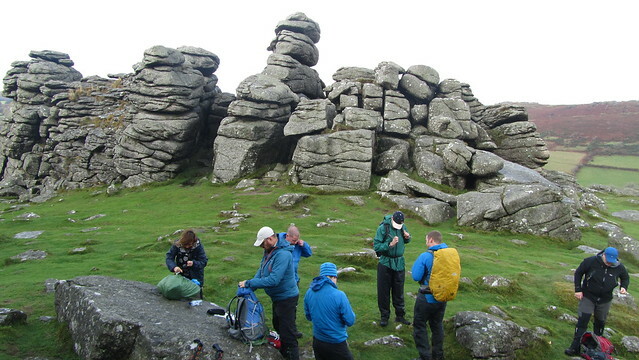 At Haytor Rocks, we turned, for the first time, in the general direction of the car park. 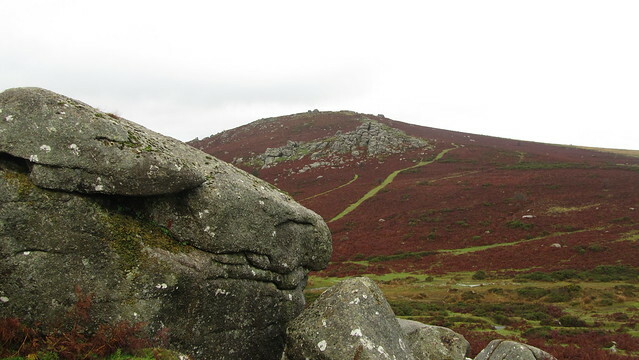 But before the end, we had visits to Fitches Holt, Emsworthy Rocks, Saddle Tor, and Top Tor. At Top Tor, we eyed up an approaching band of heavy rain moving in from the south-west and figured we had just enough time to side step to Bovey Rock and still get to the cars before it hit us. Bovey Rock turned out to be the only new bag for me this weekend, but it mattered little; I was pretty sure the main objective of this trip had already been achieved, and with still one more day to go too!